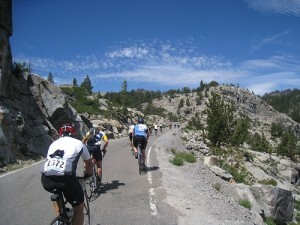 Cyclists from around the world venture to South Lake Tahoe to climb the Sierra Nevada mountain ranges, also known as the California Alps. 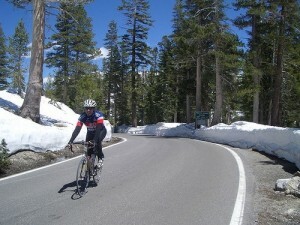 Cycling in Tahoe introduces a different perspective to the sport. I never thought I would endure, much less enjoy, climbing up a pass for hours on end, just to turn around and profit from a short, yet exhilarating, descent. If you are an ambitious, experienced cyclist who truly wants to comprehend the nature of the phrase “mountain pass,” these ascents are recommended. Monitor Pass (Route 89) commences at the junction of Route 4 and 89 about five miles outside Markleeville, CA, home to the notorious Death Ride. Turn onto Route 89 and begin your 9-mile climb to an elevation of 8,214 feet. The ever-changing scenery of Monitor captivates cyclists as they make gentle twists and turns underneath rocky crags, through alpine meadows, tree-covered mountainsides, and rolling hillsides of high-desert brush. Death Riders who ascend this pass at dawn can attest to its healing beauty and Zen-like energy, awarding Monitor the number one vote for most scenic pass on this list. Ebbets Pass (Route 4) also begins at the junction of Route 4 and 89. Continue on Route 4, paralleling a bubbling mountain stream, through a long, pine-shaded, 12-mile zigzagging eastern approach to the one-lane summit, capping out at 8,730 feet. Watch for mesmerizing views of distant mountain peaks with paramount canyons plummeting thousands of feet below the highway. This front side of Ebbets pass proves to be the most technical descent on the list, so lay heavy on the brakes around the dozen or so blind hairpin turns. 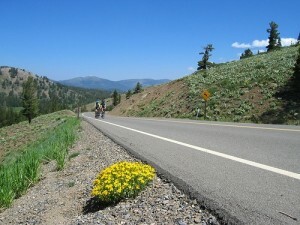 Ebbets pass is one of the least trafficked passes in the Sierra Nevada, rendering an ideal situation for cyclists who particularly despise sharing the road with automobiles. 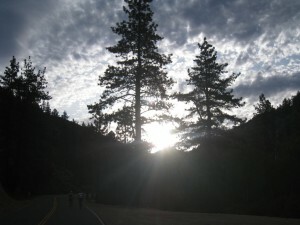 Pacific Grade (Route 4) is the western of the two passes in the area traversed by Route 4. At the end of the descending backside of Ebbets pass, the road flattens through quaint Hermit Valley and then embarks on a short, two-mile, meandering ascent up to the apex of Pacific Grade (8,050 feet). This is the most arduous of climbs on the list, as the highway rises approximately 500 feet in elevation per mile, boasting a 25% grade in some spots. Get ready to use your granny gear for this Billy goat of a climb! 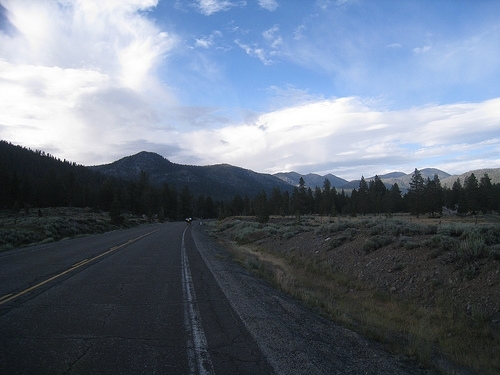 Kingsbury Grade (Daggett Pass or Route 207) is an 11.2 mile highway, connecting Route 206 in the Carson Valley to Route 50 in Stateline, NV. Start your 7.7 mile increase, ascending 3,000 feet in elevation, from the Route 207-206 junction. As you rise out of the Carson Valley, you will notice this pass is extremely exposed, making for what can be a very hot climb! Enjoy the smooth, wide shoulders, as these prove to be this moderately-trafficked highway’s saving grace. About one mile from the top, the shoulder seems to deteriorate, so use caution. At the summit (7, 730 feet), either continue down the short 3.5 mile stretch to Stateline, benefiting from awe-inspiring vistas of Lake Tahoe, or turn around for one of the sweetest descents you will ever experience! Loose the brakes on this 7.7 mile downhill back into Carson Valley, as most turns are broad 35-40 mph curves. Position yours hands in your drops, tuck, feel the air whiz past your earlobes, and shoot for your personal maximum speed record! 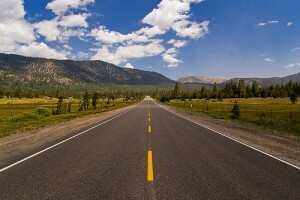 Carson Pass (Route 88), named after famous explorer Kit Carson, begins at Pickets Junction in Hope Valley and traverses along Route 88 up to an elevation of 8,650 feet. I must have terrible luck with this 9-mile climb, because on two occurrences (Death Ride 2009 and Alta Alpina Challenge 2009), unforeseen winds, rain, and hail fumed over the pass. Needless to say, this made for a bone-chilling descent. Thankfully, Route 88’s return to Picketts Junction is more or less a straight shot, a condition that enabled my skinny road bike tires to steer in such slick circumstances. If you should be so fortunate to climb Carson Pass in sunshine, views eastward overlooking Red Lake are especially astounding. Luther Pass (Route 89) is the most forgiving of the listed passes. Starting at the junction of Highway 50 and 89 in Meyers, peddle seven miles along tree-lined, gradually ascending Highway 89 to its pinnacle at 7,700 feet. If you are craving more miles and of course, more climbing, opt for a longer out-and-back by continuing onward down the highway’s three mile descent to the meadows of Hope Valley at Picketts Junction. The shoulders on Luther Pass are minimal, causing most cyclists to stick to the white line. An alternative, more technical route is South Upper Truckee Road out of Meyers, which runs closely parallel to Luther Pass along the Upper Truckee River. South Upper Truckee Road navigates up a series of switchbacks to Big Meadow campground and dumps out onto Route 89 for the last leg up to Luther Pass’s high point. Blue Lakes Road, not technically a pass, but still one killer climb, functions as a snowmobiling road in the winter. However, in the spring, summer and fall months, it is up for grabs to cyclists and campers alike. At the road’s intersection with Route 88, riders will initially find themselves surrounded by the mystical meadows of Hope Valley. Half way up this 12-mile trek, look to your right and gawk at the pine-peppered valley floor below. At the summit (8,055 feet), enjoy a well-deserved, refreshing dip in translucent Blue Lake. This isolated, low-trafficked, recently-paved road takes the cake for the best cycling conditions around South Lake Tahoe. Ordinarily, these passes are subject to closure during the winter months (mid-November through May). 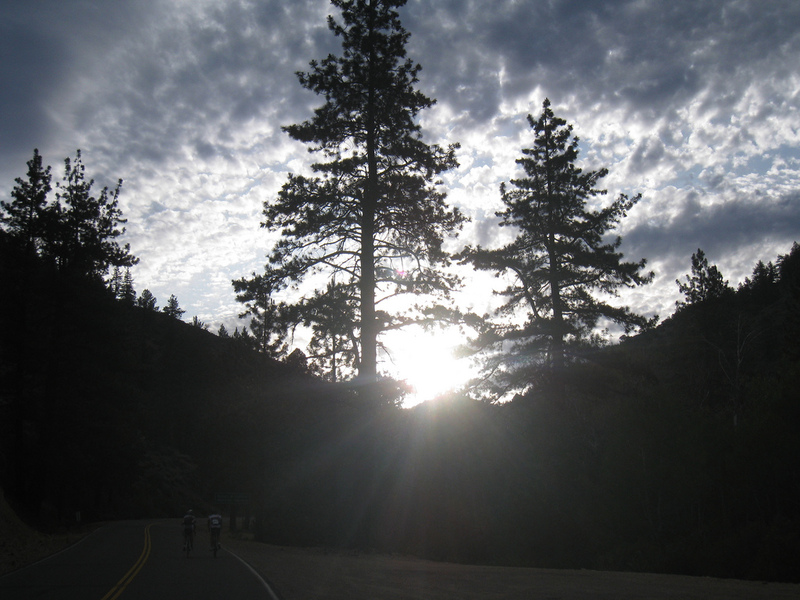 Be sure to check California Highway Conditions Hourly before planning a spring or fall cycling trip. Also, be mindful of the fact that weather can change rapidly at high elevations. As a rule of thumb, I always pack a rain jacket and a set of long-fingered gloves in my saddle bag when tackling these listed passes. Very nicely done Mary, the writing and photograph as well. Thanks for the links to Alta Alpina and I’ll see about getting a link to this from our website in return. I’ve been here before, Mary, and you nailed it! Great descriptions. Makes me know I HAVE to come back!